In general the Bird News page is where current butterfly news, and ode (dragonfly) news is -- all mixed in together. Often daily butterfly species lists, sometimes even with individual totals are there. Especially when there aren&apos;t a lot of birds to report. :) Within the monthly summaries on the bird news page typically any butterfly of note is mentioned. For each year, below, is a fairly short recap of the butterfly highlights, and sometimes lowlights, for that year. But for 2007 below, for which there is a blow by blow account of the whole season, in excruciating detail, with photos of most of the good rare fancy stuff. If you just want to see pix of a number of the better butterflies found here, scroll down past text on this page, down to the final section which has a dozen plus rarity photos, many of them were the NCR (new County record) documentation. Also there is a somewhat recent newer page called Rare Butterflies which has the photo docs of most of the best rarities seen locally. There is a link for it just below in the 2013 news section. Well this was one weird year for butterflies locally. It seemed greatly influenced by the fact that there was no freeze after fairly early in January. Which had and was followed by record numbers of species flying in Feb., March, and April. Everything was way ahead of normal schedule. In fact, for the first time in 14 years of recording monthly species diversity, April was the top month of the year with 60 species. And which was a record for April. Then it burnt out fast and early. Summer was slow, and fall worse, it downright stunk. There was no major invasion from the south as in a normal fall. Save Mestras which made a fair showing. Small numbers of a few species was it. Rains were in fits and spurts, a few heavy events but mostly it was continued very dry conditions. The flower bloom was OK to fair in the spring, but poor in fall. We remain un-recovered from the exceptional drought. Nightlighting produced very few insects overall. My entire year total for butterflies was about 88 species. Last October alone was 77 species! This years&apos; 88 all year is a drought regimen type total. Fifteen species less than last years&apos; 103. Between a 15 and 20% drop in diversity. Individual numbers were a fraction of last years&apos;. The amazing things were the lack of normally common species in the summer and fall, like metalmarks, blues, and hairstreaks. I saw 2 Rounded and less than 5 Fatal Metalmarks all year, that was it. I saw only 4 or so Mallow Scrub-Hairstreak all fall, only a few Ceranus Blues, and not a half-dozen Bordered Patch (!). One Phaon!?! What is going on? Need I say no Zebras. No spring Mourning Cloak is more expected, they seem almost bi-annual here. After a good year last year, I did not see a Viceroy! Not one Great Purple Hairstreak all year again, nor a Common (Texan) Wood-Nymph or Carolina Satyr, only White-striped for Longtails, etc., and so it went for many species. Fair numbers of Arizona Sister and Dusky-blue Groundstreak were good to see again. In spring and summer there were again this year (like last year, but after a many year absence during the drought) the Roadside-Skippers (Amblyscirtes sps.) in the same areas at Lost Maples SNA I find them. Below is a photo of one. The VHW pale gray fringe without checkering is the hangup. This is as in Oslar&apos;s, versus the checkered fringe of Bronze (aenus). It seems we need a specimen. 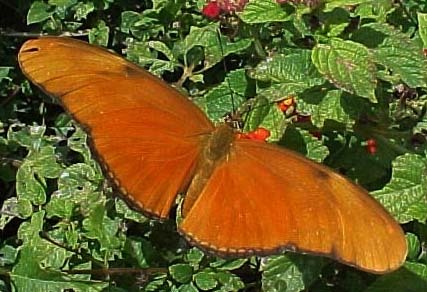 Note the rufous or chestnut color barely visible on the ventral forewing, and lack of the Celia&apos;s type pattern of pale dots on ventral hindwing. Instead a finely intricate salt and pepper pattern. Thanks to Terry Doyle, Mike Rickard, and Terry Hibbits for discussion of the beast. Amongst the poor showing from the south this fall were two good finds of stray vagrants, both photographed. First, a Mexican Tropical (aka Florida) White (Appias drusilla) was at the yellow lantana at the golf course entrance garden Sept. 30. 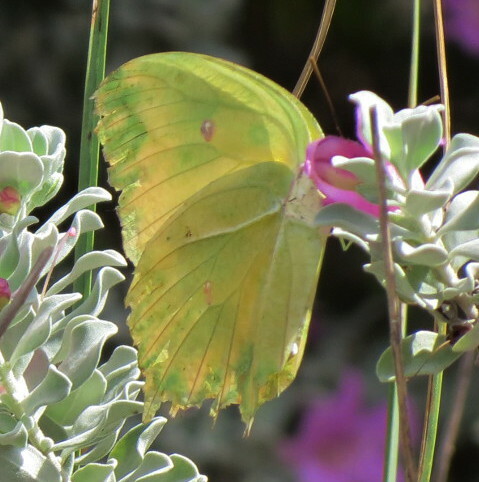 Then a Yellow Angled-Sulphur (Anteos maerula) was at the Utopia Park entrance garden on Cenizo for a few minutes Oct. 13. That was the fall mega-raries for the year. The pics are below. The Monarch movement locally was minor at best, maybe a hundred or two the best day in Oct., they missed us this year. Mid-November there was a small Snout flight, up to a couple hundred in a day. A one-day total of 7 White-striped Longtail in early August was my personal daily record locally. Usually if you get one you had a good day. So always some highlights, always some lowlights. The latter of which generally are at least as, if not more, important to note. Interesting how last year was so good, especially fall, and this year so weak then. Last fall I could easily see a thousand butterflies in a couple hours checking the gardens around town. This fall I was lucky to find a hundred in a day. In general it seems to me large flying insects overall are way down. Fireflies too had a earlier than ever spring flight, flamed out ahead of schedule, and the fall flight was poor at best. Either Bronze or Oslar&apos;s, uncheckered fringe favors Oslar&apos;s.
2016 was a good year for butterflies locally. It is the second year of recovery mode (from a 7 year exceptional drought) with significant rains. Good flower blooms in spring, summer, and fall were much needed. There were a couple feet of rain in the spring to early summer, a dryish summer, and late August through September another foot of rain. As of Nov. 5 I have seen about 103 species of butterflies in the upper Sabinal River drainage this year, all but three immediately around Utopia. Those 3 species were only recorded at Lost Maples SNA. About a hundred species were just around Utopia. My best year here was 108 species, this year looks to be second best (of 13) for species diversity. The last 7-8 years of drought the annual species totals have been in the low to high 80&apos;s. So finally breaking the 100 sps. barrier again locally was welcome. That represents about one eigth of all North American butterfly species diversity. In a year, right around Utopia. October saw a 77 species month, fourth highest monthly total in 13 years here, and highest since October 2008, in 8 years. So that was most excellent. Kathy and I saw 51 sps. in a couple hours and change one of the best days. Many of the different species are invaders from elsewhere, seemingly southward and Mexico. We have this fall invasion every year. They have been weak in the drought regimen. This years&apos; was finally nearing back to how they were at the end of the last wet cycle before the drought set in. A number of LTA - less than annual - species were seen. This to me is the big hurdle for occurrence. Birds, odes, butterflies, doesn&apos;t matter. Do they happen every year, sure thing, and so are regular and expected? Or, are they LTA, and therefore by definition not expected for sure every year? We know from the 2007 to 15 drought that 80 some species are a pretty sure thing annually. 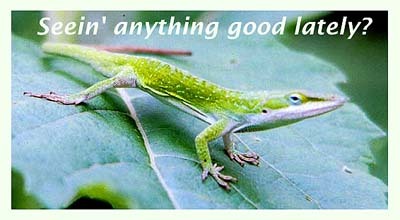 It is what else you find besides the regular expected annually species that make a good year. Especially great are the things that haven't been seen in a few or more years. Which currently there are a lot of due to the drought. Like last year when we broke long dry spells for a handful of species that were MIA and in the 5 to 7 or 8 years since being seen category, unseen since the drought set in, about 2008. This year we added a bunch more of those. The rarest thing I saw was a Purple-washed Skipper (Panoquina lucas) on Nov. 5 on one of the lantanas at the Senior Center. It provides a second UvCo record. The only prior was one I photo&apos;d at the library garden Nov. 19, 2013. Not quite as rare but way more exciting was a Malachite at Utopia Park Sept. 23 which allowed photos for a change. I had one crummy distant pic of one here from a decade ago, and have seen a couple others fly by and not stop. It is these sorts of seemingly Mexican origin vagrants that are the big butterfly excitement here. A Julia Longwing was my first since the drought as well, and only about my 6th or so here. 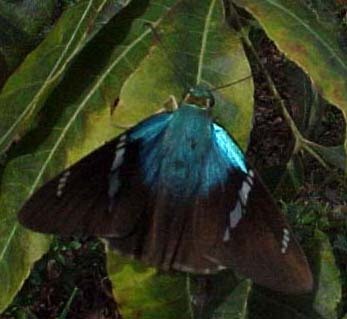 Other first-since-drought species were a Tailed Orange, about 5 Coyote Cloudywing, a Brazillian Skipper, a Zilpa Longtail, and Tropical Leafwing (2). Other less-than-annual species were Dotted Roadside-Skipper, Laviania White-Skipper (6+), Kathy had a White Angled-Sulphur I missed, Rawson&apos;s Metalmark (a few), and a couple Empress Leilia. About a dozen species were things that had not been seen in 5-8 years, since the drought set in. Most were at least semi-regular in the 2003-08 wet cycle years prior. Nearing a couple dozen Ocola Skipper was impressive as was 6 of them at once on one bush (which was when the P. lucas was found). 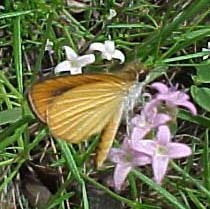 There were at least a half dozen Sickle-winged Skipper, but no White-patched. Weird was no Great Purple or White-M Hairstreak, no Carolina Satyr (which remains unseen since the drought), no Texan (Comm.) Wood Nymph, no Dark Buckeye. A couple flybys got away as hypotheticals and so not counted, one was an Ornythion Swallowtail, another a Band-celled Sister. That was what I called them on sight. I did get a fair look at a Polydamus Swallowtail though, which is very rare here. We had a fair number of Crimson Patch for the first time in years, mostly at the new deco gardens around town, and one for the yard list. Arizona Sister seems to be making a strong comeback. Several White Peacock were a good showing for that LTA species. Did have a Mourning Cloak, and a very few Zebra Longwing. Peak days the numbers of some species in the October fall invasion were impressive. Some days had over a hundred each of Bordered Patch, Phaon Crescent, Sachem, and Dainty Sulphur. Over 75 Theona, over 50 Elada and Gray Hairstreak, over 50 Large Orange Sulphur, Mestra was 300+ in a day at peak. The fall invasion was thousands of individuals, it was amazing. Walking down the gardens was like visiting a gallery of butterflies on the flowers. It took three hours to rush through them at peak in mid-October. If I lived in town and could check them more I would have added a few species. There was no major fall flight of Monarchs. I saw 10 in a day at tops. I heard one report of a couple days of 1 a minute for a while out along Little Creek. Nothing major though. There was a week long flight of a billion Snout in early September though. I'm sure more coverage at Lost Maples would have added a thing or two, but when you get past 90 species for the year locally, you have all the regulars and only rather unpredictable vagrants can add to the list. Spicebush Swallowtail, Silvery Checkerspot, and Little Wood Satyr are the three species I saw at Lost Maples and not anywhere else locally this year. Plus an (uncounted) Amblyscrites (Roadside-Skipper) that might have been Bronzed. All in all it was fantastic to outstanding for butterflies locally this year. Especially in October when the annual fall invasion peaks. Mid- is best. And especially since fall bird migration is on the weak side here, it is nice to still have vagrants to see. Especially when they are from Mexico. The winter and early spring were very dry, but a couple FEET of rain in May busted the drought. Though we quickly moved straight back to a no-rain cycle after a little in June. Summer was the same drought regimen as has been the usual lately. Far below normal rainfall in June, July, August, and September. Only a 2" event in August and a 3" event Oct. 9 broke the dry spell. So late summer flowers were somewhat weak save the Snow-on-the-Mountain, which is not really a big attractant, save when it is the only thing open sometimes. The year was noteworthy for a number of species seen that had not been seen the last several years of drought. The May rains were enough to change things. Here is the list of those species that occurred this year which have absent lately due to drought. The last prior year recorded is then noted (when I could find them quickly), or an estimate is offered when I don&apos;t have a sure last month seen dug out yet. At least 9 species were seen that I had not seen in a couple or more years, since the drought set in for most. So this was a remarkable insurgence and great to see, giving us some hope for some drought recovery. Some like the Nysa, the Sister and the Groundstreak were common to abundant in the wet cycle of 2003-2008, and have been all but absent since the drought set in. This space reserved for all the great things I will find in the fall. Turns out I didn't need it. Update: After mid-October we had 6 more inches of rain! Which mostly wiped out the butterfly season locally as there was one single 3" event. Heavy rain is a season killer for butterflies. There was one interesting sighting in late October, an Adelpha sister which appeared to be a Band-celled. As of mid-November the butterflies never recovered from the late October heavy rain events. I did a quick count and come up with 82 species of butterflies seen locally this year, not counting the late Oct. Adelpha sister. At the low end of the scale for annual diversity here. There was very little of the usual fall southern (origin) invasion phenomenon this year. Maybe they kept going due to lack of flowers. May and September tied for best monthly diversity at 58 species. First time May has done that. There was one good Monarch flight day. Trickles of them were steady from mid-Sept. on, a few every few or several days, all south to southwest bound. Then Oct. 13 there was a liftoff event where hundreds took off out of river corridor north of me (probably at the Frostweed patch at Berteau Park) and were gaining altitude heading out for the day. There had to be at least a couple thousand around, I saw about 500 in a bit of looking over a few hours that morning, just seeing one little piece of habitat and sky for an hour of a several hour event. It was a weak year overall for butterflies, and often flowers, no coincidence. The drought has really taken a toll on both. I detected only 80 species this year locally, with 55 sps. the high month in October, 54 next best in July. It was dry until May when a 7" rain event, August had a 5" event, and Nov. saw a 3". So finally rains came, but too late for spring. An interesting record was my first Feb. record of Great Purple Hairstreak, which was at a Mistletoe (the larval foodplant) and undoubtedly had just emerged as it sat for an hour in the sun before taking off. April and May were the worst for flowers in a decade, and butterflies weak at best. A Zebra Heliconian in yard in June was the 1st one since June 2012. Their occurrence here is an interesting roller-coaster. I saw none in 2011, in 2010 only one, and none in 2009. So three single sightings in the last 6 years since the drought started. The last year I saw Zebras here in multiple numbers daily was back in 08 when there were five you could see nearly at once in the woods at Utopia Park. 2007 was a minor invasion year, 2004 was the real big invasion year when they were everywhere locally. This Zebra in June 2014 was seen on and off in July (presumedly the same one around yard) but August and September no more showed up. Northern (Common) Mestra showed this year in June and July, and up to a dozen in a mile in September. They do not occur every year. Excellent was a Cassius Blue in August, another less than anuual species for me. October was peak month of year with 55 sps. but all the most expected types and no rarities. There was a peak Monarch flight day of 700+ over a couple or few hours on October 24. The butterfly of the year was Nov. 9, a SPOT-CELLED SISTER in the river habitat corridor moving north. It is the third that I have ID&apos;d here, and Nov. 11 (2005) was the date of the first one I found (which was the first Uvalde Co. record - photo'd) several years back on Seco Ridge. 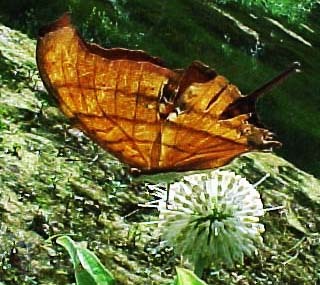 Pics of that one on the "rare butterfly" photo page (and last pic of strip below). Looks like second week of November is when to look for them. I have had a few un-ID&apos;d Adelpha sisters here in late fall besides the few I was able to positively ID, so likely a couple more have been here. One was a Band-celled once though. Arizona Sister barely fly into earliest October, if that, so any late fall season sister should set off bells and sirens. And with that sighting the year flamed out. Slow overall, but a great super-mega rarity to save the day at the last moment as far as butterflies for the year were concerned. The key is to never stop looking. The year started in the throes of severe drought, we had a bit of rain in spring, enough for a good spring bloom, then dry again until August-September when we got enough rain for a good fall bloom, all things considered. 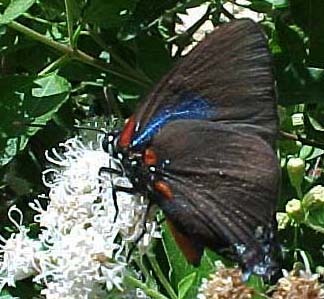 Several species remain absent since the drought set in, as in Arizona Sister, Crimson Patch, Dusky-blue Groundstreak, Carolina Satyr, and others. No Longtailed Skippers of any sort all year as of late October! There is a new page of just the rarity photos, linked at the butterfly photo main index page, the bird news page, butterfly list page, etc. It puts all the unusual stuff together in one spot. The spring highlight was finding a large number of Mourning Cloak caterpillars, with eventually many fresh mint individuals emerging in our (new) yard. Hackberries are the foodplant here no doubt. At least 20 were seen, which is more than I'd seen in prior 9 years here, right in the yard, though I did have a couple others locally. There were a few good southerly origin invaders to show up this year, mostly after the rains came. Summer and fall is the peak butterfly season here, and that due to invaders from elsewhere. The big break in status in my view is: annual, or less than annual. Some of the less than annual species that showed up this year were 1 White, and 2-3 Yellow, Angled-Sulphurs, 2-3 Mexican Fritillary (photos - ph. 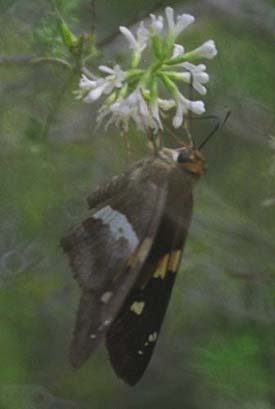 ), an Ornithyion Swallowtail, 1 White-patched Skipper (ph. ), 4-5 White Peacock (ph. 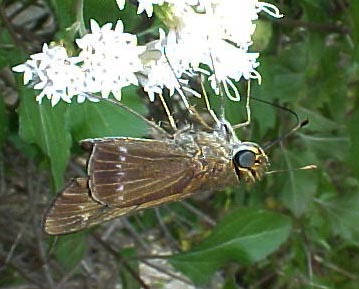 ), a Ruddy Daggerwing (1 ph.) and a half-dozen Soldier. Mestra sometimes numbered 20-30 in a day, no Zebras though. of purple iridescence to show well but you get a hint of it. 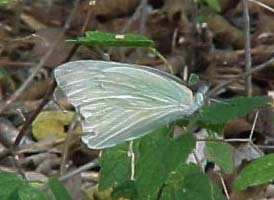 The band of white dots crossing ventral hind-wing is definitive. The best thing is the rarest thing you found that you documented, so as to be irrefutable. The above Purple-washed Skipper was that for me this year. Second best documented (photos) beast was Great Southern White (Ascia monuste), which I have only seen a few years of 10 here, and only doc&apos;d it once before. Both were on November 19. The best stuff is often late in the season. The other best butterfly was undocumented (no photos), but was also "new to the local list" for me. On July 26 a Polydamus Swallowtail was about yard for a while, not new for the county, but new for me here locally. 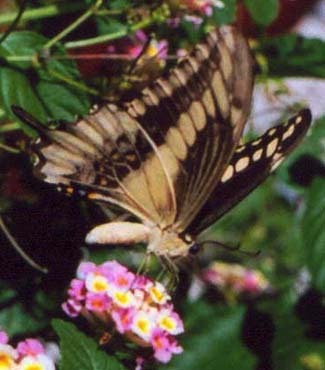 An Ornythion Swallowtail was seen-only as well in late June, I have photos of an Ornythion prior (2006) here locally. The big Monarch movement day was Oct. 21 when 500 went over yard in a half hour. The most amazing thing was a Black Swallowtail at 50 feet altitude moving south with them! 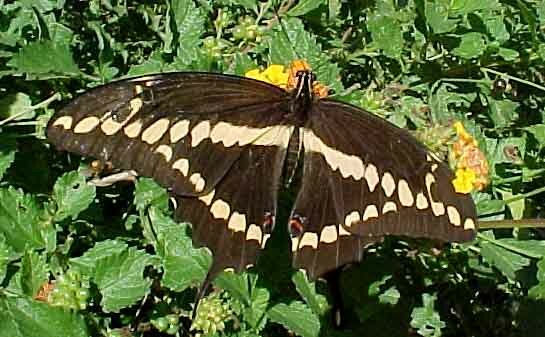 About a week later a second Black Swallowtail female was seen flying SW 50&apos; up. As of Oct. 24 I count 84 species seen locally this year. Three of the last four years the total was in the upper 80's so normal for a drought regimen I guess. September saw 61 species in the month which is the highest monthly species diversity total going back all the way to October 2010 - three years, and besides that month going back further then to October 2008. So only one month in last 5 years (Oct. 2010) was better diversity since the drought started. Added two more on Nov. 19, so 86 species for the year now. It's rough out there for butterflies in a drought cycle. Plant native butterfly flowers and or garden around the yard, and spray some water about regularly, it really brings them in. We water daily and it is an incredible magnet for butterflies, within a minute or two they start showing up. A little bit of wetted caliche puts out a nice calcium scent which seems to really attract them. We got some rains in spring and had a good bloom, but butterfly numbers remain obviously devastated from the exceptional drought. I saw no Arizona sister this year again, a few years ago seeing 4 in an hour at the park was normal, now absent, as are a number of species. 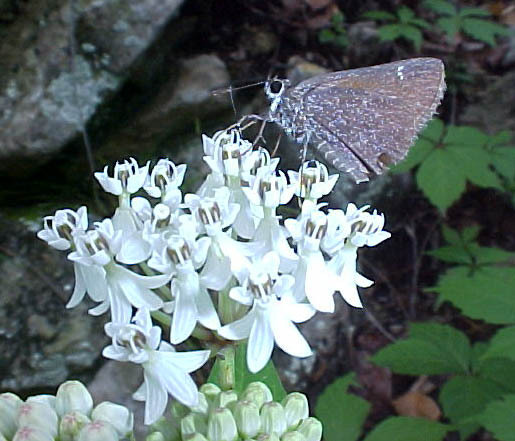 No Carolina Satyr, Crimson Patch, Dusky-blue Groundstreak, etc., etc. Apparently some of the populations were far more tenuous that I'd have guessed based on the numbers present in &apos;good (wet) times&apos; my first 4 years here. A couple good things were seen, the best one not here but nearby, some Banded Peacock were in a couple places in Uvalde County including Sabinal, and in Bandera Co. at Love Creek. So they passed by us. Three White Peacock were the first of them I've seen locally in a couple years, as was a Zebra Longwing, but only one Zebra, in June, and no invasion followed here. July had a 58 species month, the best since October 2010, and for the whole year. August through November were good though, all 50+ species months, 56 in Nov. second best. December had record high diversity, beating by highest prior species total for the month (31) on the 1st (33)! The best thing was the July BROWN LONGTAIL (Urbanus procne), which was the first reported from Uvalde County ever, and #140 on our local list of species known around Utopia. Unfortunately I passed on the long distance docushot to get closer, and it bolted. 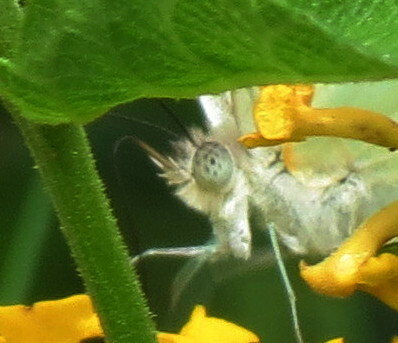 I did get good views in my binocs at 10&apos; and saw it at arms length and eye-level as it flew past me from a buttonbush. My favorite doc&apos;d find was a Black (Bordered) Patch, a different subspecies, and morph, of the common Bordered Patch without the color on upper wings. It is "hardly ever encountered east of the Pecos River" (C.Bordelon - pers. comm.) so a good find, besides being a stunning beauty. Chlosyne lacinia crocale, at Utopia Oct. 19, 2012. Thanks to Charles Bordelon for the ID and info. Late Oct. and early Nov. there was a Wallengrenia otho (Broken-Dash) skipper that looked like Tropical, not the normal expected Southern. It had a distinct C shaped line on ventral underwing, much more obvious than the low-contrast 3 on VHW of Southern. It was also smaller had a different stigma, surely it was a Tropical Broken-Dash. Two different days it flushed when I went in for pix. Actually I thought I had this subspecies in 2007 as well. Early November had 40+ species in 40 minutes on best days, and at least a thousand butterflies at the 3 main gardens. The newly planted decorative gardens at the road curve at the north end of town, and the one at the park entrance are both very productive, as continues the library garden. Nov. 3 saw 49 species in less than 3 hours at these 3 sites. One of the best finds of the year here was a Cerambycid (Long-horned beetle) found on Lantana while hunting for butterflies, which seems to be a rary, the only pic for Texas at BugGuide.com is a specimen from 1953! So actually the rarest thing I found this year was a beetle, and only because I was checking flowers for butterflies. Tragidion coquus, and thanks to Mike Quinn for the ID! Again I prove the blind acorn can find a squirrel. Then December had the highest diversity ever for that month here, the newly planted deco gardens seem the biggest factor. 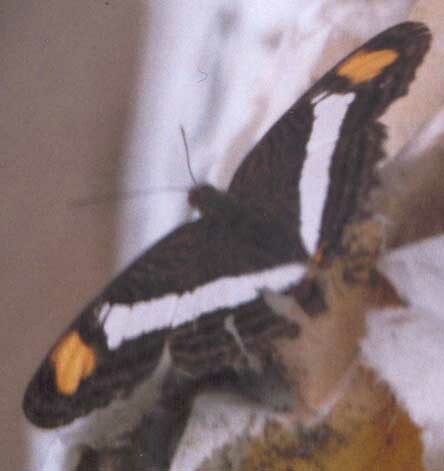 Most interesting was this rare winter form of Phaon Crescent that lacks the orange color, and instead is a buff or ivory white as a base color above. I didn&apos;t know such a beast existed. 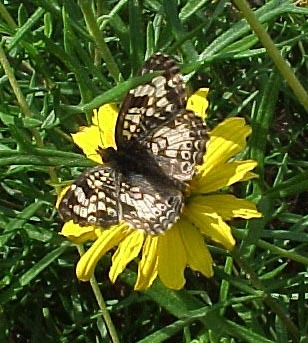 (Phyciodes phaon) at Utopia on December 1, 2012. Then on Dec. 5 I saw (in binocs) in the front yard what I am sure was a Purple-washed Skipper (Panoquina lucas) which is the first sighting of that species for me here, and new for the hypothetical list. The exceptional drought continued and butterfly numbers were worse for it. Less than 70 species were seen over the whole year, the lowest diversity in 8 years of studying it here. We've had better single months. Most species numbers were way way down, some are just plain absent, like Crimson Patch, Carolina Satyr, and others. 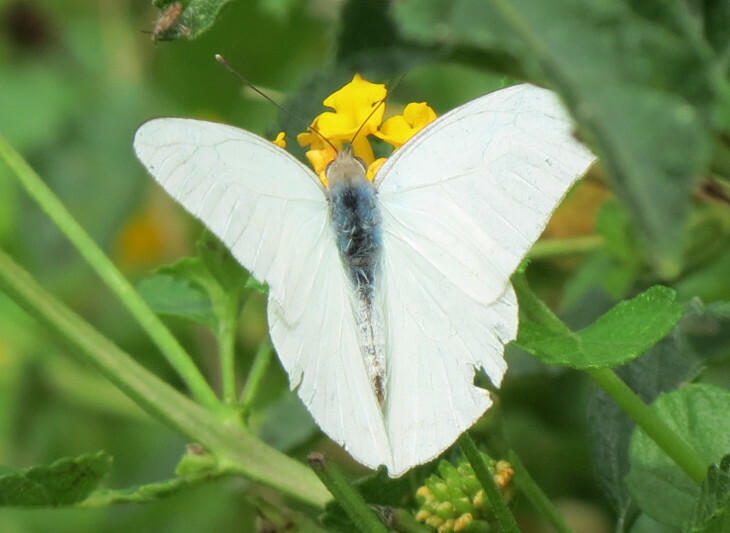 The only rare butterfly seen (and only new to the local species list for the year) was a Mexican Tropical (Florida) White (Appias drusilla) on the late date of December 3 at the library garden (photos). garden was maybe the second ever documented in Uvalde County. Most notable was the absence of species in 2011. No Sister (Adelpha), whilst they were common at the park before. 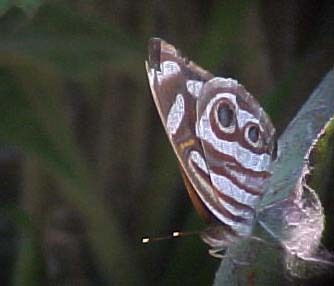 No Carolina Satyr, Crimson Patch, Dusky-blue Groundstreak. No Zebra, Mestra, or other southerly origin invaders. It was so dismal it was hard to pay attention to keep track. A little fall rain brought some flowers, which usually had just about nothing on them, until some south-born stuff finally got here in November whence the biggest diversity month of the year occurred. Odd, the first time the high month of the year was in November in 8 falls. That is how bad it was all year. Nearly half of the 68 species seen were represented by only ONE individual. The common stuff was scarce, the scarce stuff accidental, the rare stuff non-existant. 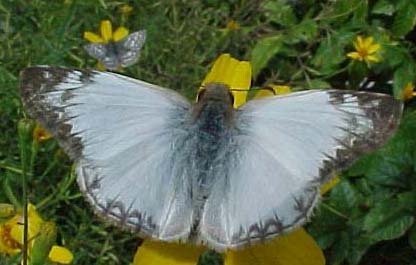 Save the one new species for the local list the whole year, the Mexican Tropical White. five years. Such is the story for many species. 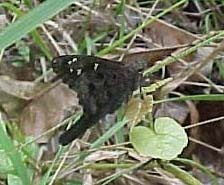 NO Carolina Satyr, Long-tailed Skipper or Soldier this year. handful of Arizona Sister, and so it went for local residents. first in a couple years. emergence, and my only spring record ever here. the year up: 87 species locally for the year as of Nov. 20.
upper 80's for species diversity the last two years in a row. total to 87 by November. over the last 6 years, and no photos yet. many rarities after the end of the notes. year. I recorded 89 species in the area in 2009.
defined as new to my local area list of species recorded. 1500 square feet of heaven on a good day. looks at the orange rock candy on the ventral hind wing. times you just have to take your views and be happy. and are my first local sightings of both species. No Zebra Longwing or Northern Mestra this year. the dam in September, far far less than annual here. A White Peacock showed in November, also not annual. and all form of life reported on in one place there. Birds, bugs, beasts, and even what flowers are blooming. the unusual stuff, and photos after the text. predictable, nothing in great numbers, scarcity the theme. were from Hurricane Dolly and then T.S. Edouard in July. usual we get their leftovers, and overshoots here. butterfly that does not occur here every year. butterfly photos page. Watch the Red Turks Cap for them. 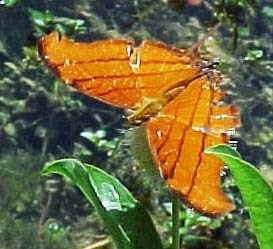 Ruddy Daggerwing at Lost Maples, August 16, 2008. In October things picked up quite a bit and I found a very good total of 83 species locally in the month. Keep in mind lots of the diversity, and much of the extra stuff is invaders from elsewhere, which is what makes fall the most exciting time for butterflies here, but there were no real rare species, though some Zebra Longwing were about, 5 one day at Utopia Park. 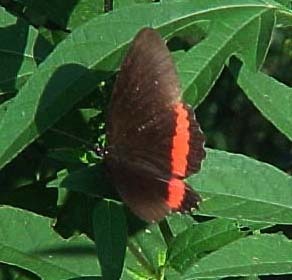 Now, regular notes about current butterfly sightings (and Odes) are put on the Bird News page. The following summary highlights and discusses some of the interesting aspects of a season, or year (2007) mostly in the Sabinal River Valley around Utopia. It was fairly anomolous compared to the few before it. 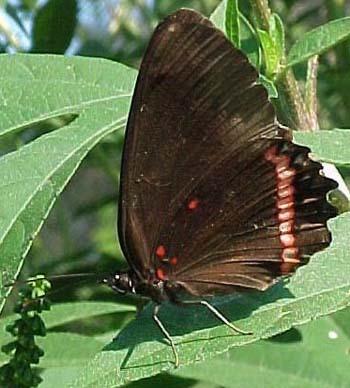 Ruby-spotted Swallowtail at Utopia, November 20, 2007.
around the Utopia area, with a little Concan and misc. Uvalde Co..
Edwards Plateau. At north end of town is south border of Bandera Co..
only saw ventrals of anything "up top." The Ragweed was like Jack and the Beanstalk. the LRGV, it is the hill country, so I think a reasonable one month total. from Tarpley to Lost Maples to Leakey to Garner found 100 (One hundred) species. as well as more even coverage thoughout the year. in September '07. Significant, for literally in a small pocket of the county. mostly in and around Utopia, along the Sabinal River corridor. Respectable me thinks. that have been found away from the Rio Grande Valley. color dorsally in the books, iridesces brilliant neon metallic gold-lime in the sun! Malachite at Concan in October. the prior 3. I saw way over a dozen, instead of one or two, or none. September Nature Quest, and I saw another at the Uvalde Fish Hatchery in April. in the hundreds (in a day) and surely many many thousands cumulatively over the season. abundant with over 100 at once at UL. that were common or regular, that were nearly absent three prior seasons here. It certainly felt like an invasion. Was it a response to the 4' of rain? We were covered in things we couldn't find for three prior seasons of looking hard. occur once a decade, more or less often, whenever there is 4' of rain, etc., etc.? puddling for instance, but getting a picture is infinitely harder than netting one. In other words, if I was netting I could have proven their existence or presence much sooner. Brazillian Skipper (Calpoedes ethlius) locally. Metalmark, Blue, or Hairstreak. Mallow Scrub-HS was more common than ever though. (Anartia jatrophae) went unseen locally this year. 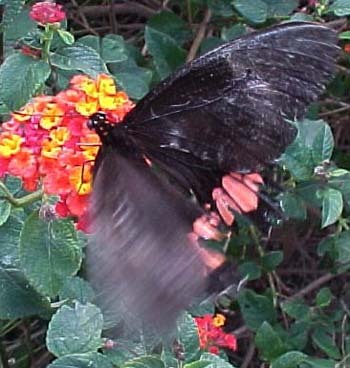 In the spring there was a Mourning Cloak (Nymphalis antiopa) "hatch" or flight. First in April at Concan during spring Nature Quest a remarkable four were seen. it was at, about 4' x 8', but it was at 1500' on a rocky juniper slope! of Black Witch moths reported around the area this fall, perhaps 5 or so. were seen, but always THE fanciest moth, the LUNA, was at Lost Maples in spring. You can tell someone must be living right, when they get to see a LUNA around here !! 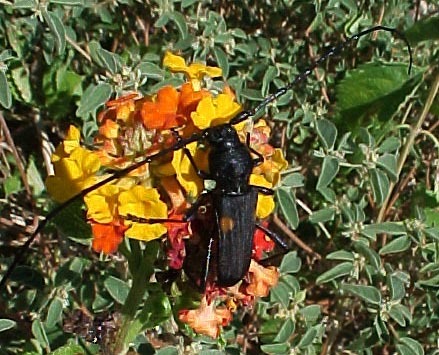 Only a very few each of Texas Wasp Moths and White-tipped Blacks were seen this fall. And a few Ctenucas, but very cool was the Sisiid (voucher by Terry Doyle in Bandera Co.). Four full seasons now, and I still haven't found a Buckeye I wouldn't call Common. but neither liked the looks of me apparently. 15 species. I'm sure the 108 is a yearly total record for me here. or did within the last, say, hundred million years, give or take a few. A hot-rod expert might be able to find 125 or more locally in a good flight year. My complete Utopia area 4-year list (within 4 miles) is now 129 species. up with all my dumb questions, and graciously helping a greenhorn get it. Check out the new Butterfly List page to see the whole list. Now here's the eye candy to reward you if you found the above drivel interesting. Poor photos of good bugs, but importantly constitute documentation of the records. ....a 2007 hit parade so to speak, with a couple "oldies but goodies" at the end. Two-barred Flasher (Astraptes fulgerator) Nov. 4, 2007 at Library, Utopia. Julia Longwing (Dryas iulia) at a lantana in Utopia, Nov. 3. 2007. 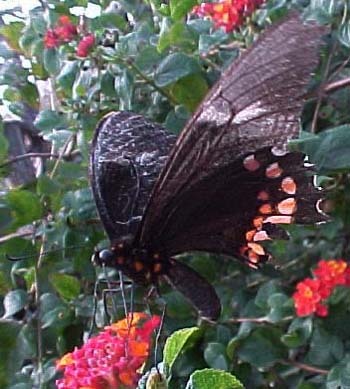 Ruby-spotted Swallowtail (Papilio anchisiades) at a lantana in Utopia. The first Uvalde Co. Record, on November 20, 2007. Often rarities that have travelled hundreds of miles are quite torn up. Sept. 23, 2007, the first Bandera County record. known. Dozens were in Uvalde Co.
Red Rim (Biblis hyperia) at Uvalde. 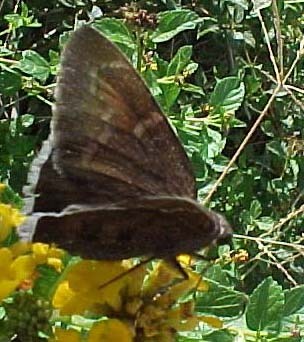 Coyote Cloudywing (Archalarus toxeus) were common this fall. Laviana White-Skipper (Heliopetes laviana) finally stopped for a picture. Male Great purple Hairstreak (Atlides halseus) is always a stunner. Least Skipper near Utopia, May 10, 2007. Dorantes Longtail, Bandera Co. NCR, Sept. 30, 2007. Ornythion Swallowtail (Papilio ornythion) Sept. 2006 in Utopia. of the month, or year !! 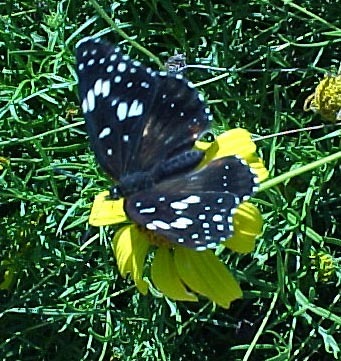 :) Only a few have ever been found in Uvalde Co..
Gold-spotted Aguna (Aguna asander) Sept. 2006 near Utopia. I only saw one for sure in 2007, in Concan. extreme south Texas, this one photo'd 11/11/05 in our yard 2+ mi. W. of Utopia, Uvalde Co.